This feels like the end of a very long week, mostly a good long though. That means it’s time to see how well I followed the Five Karate Moves to Success. I decided to restrict this week’s review to just one day: yesterday, the day of the baby shower. Let’s call it a theme. I know, the anticipation is killing me too. This one is actually pretty easy. My dad has been throwing around the idea of building Theo a sandbox for a few weeks now. He decided that the baby shower would be the perfect day for it because: A) Theo would have something to feel special about even though most of the presents, and the attention, weren’t for him; B) My dad cares only a small amount about the typical activities involved in a shower; C) He would be at our house. He was thoughtful enough to run all this by me and Melanie, and we agreed that it would be fine. The timing worked out so that almost all of the actual construction happened after most guests had left. Also, my dad had already completed the bulk of the prep work; he came with boards measured, cut, routed, and sanded. So, to be fair, I wasn’t involved in a good portion of the making. To be even more fair, I didn’t actually help that much with the assembly either. My brother-in-law had previously agreed to help, so he and my dad laid it out and screwed it together. I will take credit for the placement, the octagon shape, and the size, which should be just about perfect on all accounts for Theo and friends. I will also take credit for shoveling about five hundred pounds of sand. My redemption, however, comes in the making of the “bench” for the sandbox. After the assembly was finished and the sand was added, we decided to use an extra board to create a handy bench seat on one side. While I didn’t do the cutting in this case either, I did complete most of the routing and sanding and assembly. Aside from needing a little more sand, I think the project looks pretty damn good. 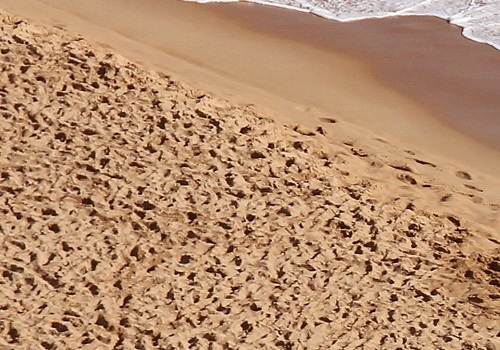 A yard of sand is literally a ton of sand. Yes, this is the correct usage of literally; a yard of sand weighs two thousand pounds . It is also happens to be (figuratively) a lot of sand. Really, I should say that a half-yard of sand is a lot of sand because that’s how much my dad brought in his small pickup. Really, I should say that it’s a lot of sand when you’re shoveling it but not that much when you spread it out in a sandbox with an area of almost sixty square feet. We still need another half-yard or so to fill the sandbox out (in?). If you buy “play sand” by the bag at a big box home improvement store, it will cost you a little over $3.50 per 50 pound bag ($70 for a half-ton). If you buy masonry sand from a landscaping or builder supplier, a half-ton will cost you about $11. It’s the kind of sand you find in creek beds, and it’s great for sandboxes. When moist, it can be used to build castles, mountains, and caves. And when you’re finished playing, it just brushes off without leaving your hands and clothes soiled. We even found a few rocks in our batch, and they were smooth and shiny, worn down from their time at the bottom of what I imagine was a pleasant stream in some tranquil woodscape. Yes, I karate-chopped the sand. I had never built a sandbox before. I’m not certain, but I also don’t think I had used a router before (although I’m a little suspicious of that). I had never before added such a prominent feature to our backyard. Our only real customization at this point is that we have added some potted plants and a few bird feeders, allowed the deck to deteriorate, and not filled in all of Rory’s holes. In addition to the toys scattered haphazardly around the yard, the sandbox really solidifies the space as Theo’s. While it is clear that “someones” were nice to me in this situation–they were giving their time and energy to build this sandbox–I also feel like I was being a little generous in allowing the construction to take place. That might sound odd, I guess. “I’ll allow you to do something nice for me.” But, accepting help is not just a selfish act. It is nice to let someone do something nice for you, especially in this case. My dad is a builder. Even without his background as a carpenter, he would still be drawn to creating something with his hands. And he enjoys the process and result of putting his skills to use for someone else. Multiply that by the grandchild factor. And then multiply that by the building with your son and son-in-law factor. It’s like calculating the volume of a cylinder (sandbox): radius squared, times pi, times height. It’s a volume of generosity. Also, it was pretty nice for Theo. He can hardly stand how much he loves playing outside, digging and moving dirt. I guess I tricked you (and myself) there. I was planning on a shower-themed review, and instead, I went even more specific with a sandbox theme. Writing is funny sometimes. I hope you had and have a great week.